Organizers are calling the first Triple A Housing Summit a success. Upwards of 150 people attended the event which took place on Sept. 25 and 26. The Summit brought together elected officials, social planners and senior staff members from both Langley City and Township. The summit took place at the same time as the UBCM held in Whistler, but organizers were encouraged that both municipalities sent representatives. Councillors Kim Richter and David Davis attended on behalf of the Township and Coun. Rosemary Wallace represented Langley City. Rebeca Brown attended on behalf of MP Mark Warawa. With a traditional blessing Kwantlen Elder Kevin Kelly opened the summit. The day and a half event consisted of four panel discussions and two keynote addresses. There were numerous displays, vendors and companies catering to seniors and their needs. The next step, organizers say will be a meeting of the Triple A Housing Society members to compile the information received from the panel discussions. This information will be added to Langley Senior Housing Survey which was completed last January and a full report will be released in the near future. A new local company, Harmony Kids Yoga, offers childrenâ€™s yoga and gets the kids involved in helping others. The Harmony Kids Yoga company recently celebrated the end of a three-month Kindness Project which encouraged its students to perform acts of kindness in their home, school and community. These acts were recorded on paper and have grown into a 20 foot long Kindness Chain. The company, owned by Jennie Abbot, has â€˜Off the Matâ€™ projects, so the children can see what a hugely important part of society they are. Recently, Harmony Kids surprised its students with a presentation showing the result of all their Kindness. The company donated one dollar per chain link to the Langley Animal Protection Society. On Nov. 5 Paul Anglin, the volunteer treasurer of LAPS, was on-hand in the yoga class to accept the donation along with extra dog and cat treats from each child, to be donated the shelter. And it doesnâ€™t stop there, Harmony Kids Yogaâ€™s next Off the Mat project will be working with itâ€™s students on a project benefitting the local Food Banks through the popular Basics for Babies charity drive. In the new year, the company is set to pair up with Karma Teachers a hugely popular non-profit organization, that offers free yoga for homeless residents in Vancouverâ€™s downtown eastside and offers full scholarships for yoga teacher training, to offer residents the opportunity at a fresh start to life. Harmony Kids students will be involved in a project that will work to assist with raising funding for much-needed larger facility for students of Karma Teachers. Like the vino that the annual celebration revolves around, the Fraser Valley Wine Tasting Festival seems to get better with age. The 25th edition of the festival at the Willowbrook Shopping Centre hit a whole new stratosphere, both in terms of attendance and money raised. For the second time in the festivalâ€™s history, it sold out with more than 1,000 tickets sold. Early estimates have more than $70,000 raised, and that may rise to close to $80,000 once the final fundraising total is tabulated. Proceeds will go to the Autism Society of B.C., the Access Youth Outreach Services Society (formerly PoCoMo Youth Services Society), and Focus BC which helps troubled youth with education and therapy. Organized by the Rotary Club of Langley Central, the event has raised more than $800,000 for local charities since its humble beginnings in 1989, when the inaugural festival at the George Preston Recreation Centre raised a modest $900. â€œItâ€™s going very, very well,â€ club president Guy Tousingant at roughly 7:30 p.m. Saturday, early on at the gala. 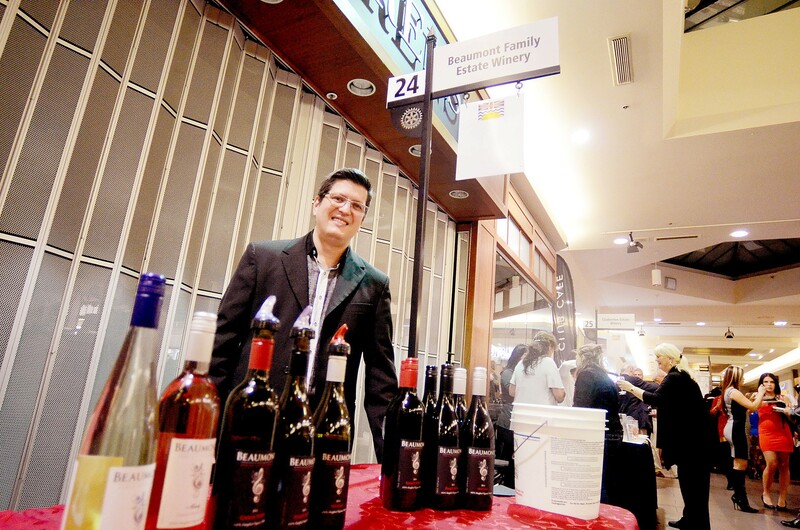 The festival featured 38 wine merchants offering more than 200 different types of wines from all over the world for local oenophiles (a.k.a. wine enthusiasts) to sample. Club members John Morgan and David Taft co-chaired the festival. Morgan offered a â€œbig thank youâ€ to diamond sponsor, BDO Dunwoody, which he noted has donated $90,000 to the event over the past six years. Morgan was thrilled after the event.